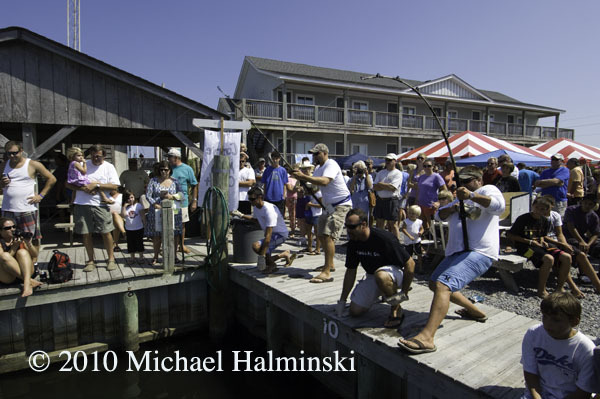 One of my favorite festivals on the Outer Banks is Day at the Docks. 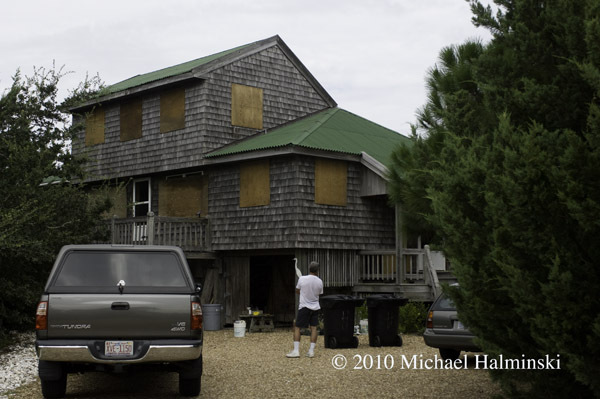 Held in Hatteras Village every September, it originated as a way to jump start the economic and general interest in that town, after being devastated by Hurricane Isabel. 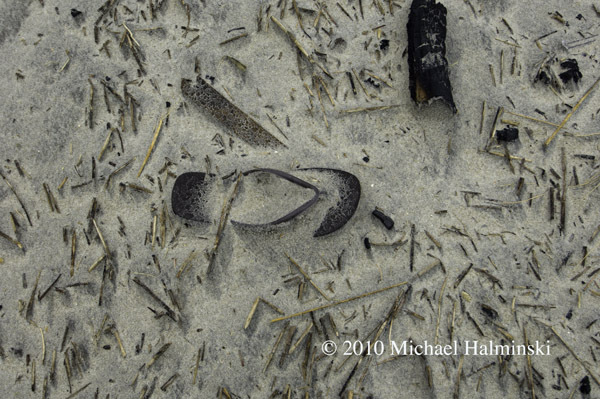 I photographed it as a magazine assignment in 2005, and have attended ever since. This year, it was held on a beautiful Saturday, September 18th, with lots of exhibits, demonstrations and activities, mostly related with working on the water. 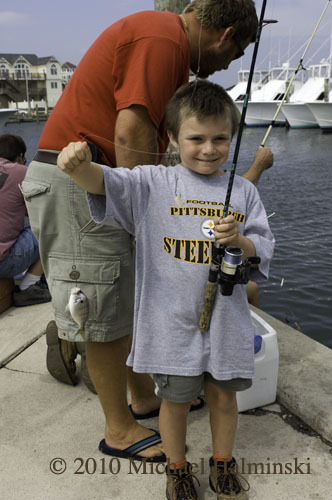 Events like the concrete marlin contest, mullet throwing, survival suit race, seafood chowder cook-off and kids fishing tournament are popular, as are the seafood cooking demonstrations by local chefs. 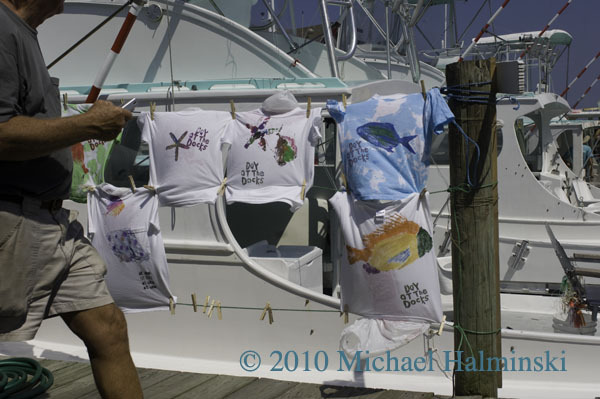 You can make your own fish print t-shirt. Mingle with fishermen and boat captains on the dock. Contestants reel in concrete marlins for prize money. 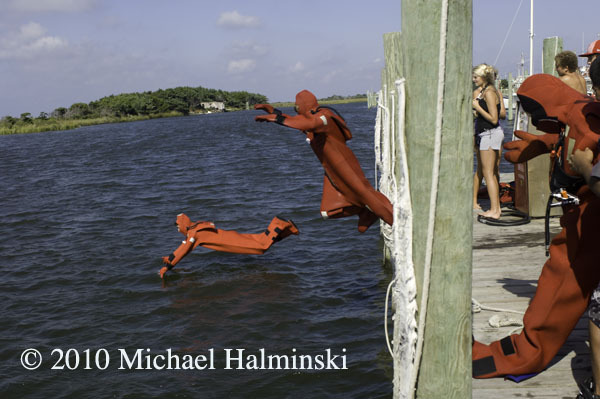 The survival suit race is quite the spectacle. Nicholas Midgett and his freshly caught pinfish. 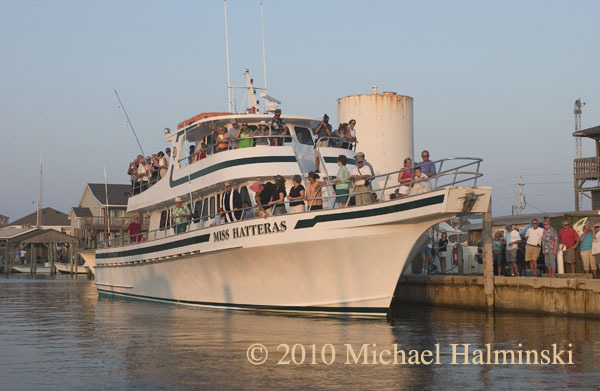 The headboat, Miss Hatteras sits at the dock for the blessing of the fleet. 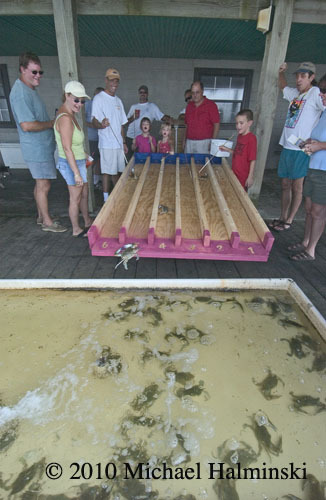 Day at the Docks has grown each year, and is a fun way to spend time with family, friends and community. 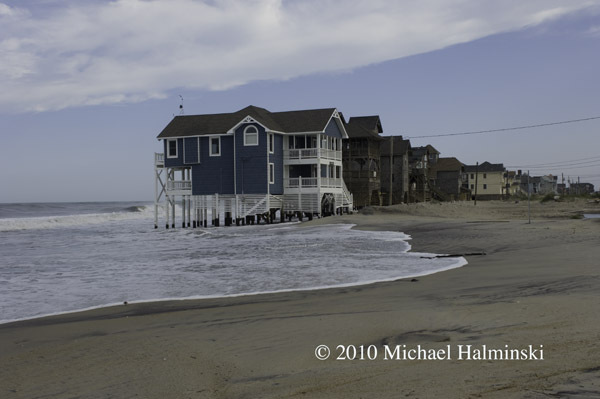 So if you’re in the area next September, I highly recommend checking out the waterfront at Hatteras Village. 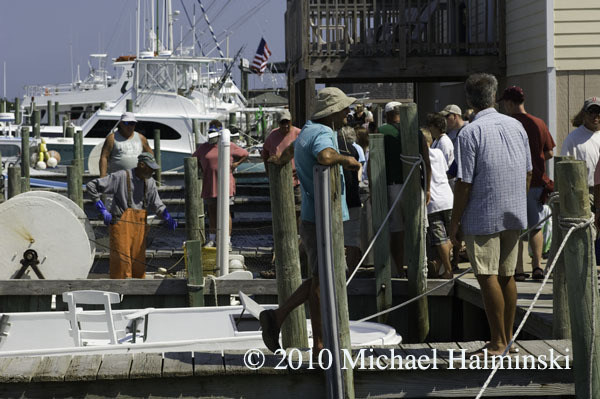 This entry was posted in commercial fishing, boat, pamilco sound, gillnetting, Outer Banks, People on September 22, 2010 by j0jgvm89bj. The final situation here was not nearly as bad as we were anticipating. 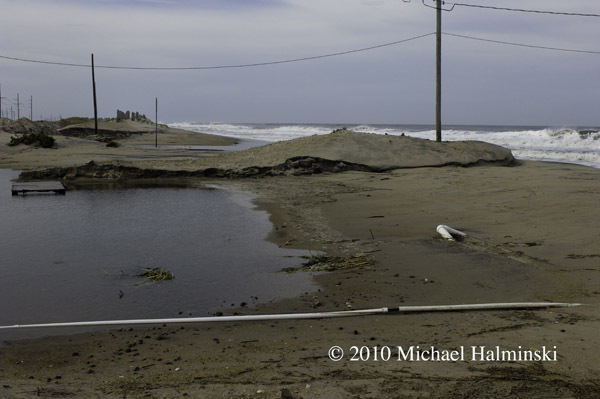 Over wash on the oceanside was minimal, as was the moderate 4 foot surge from the sound. Other than some broken branches and debris in the yard, most everything is okay. 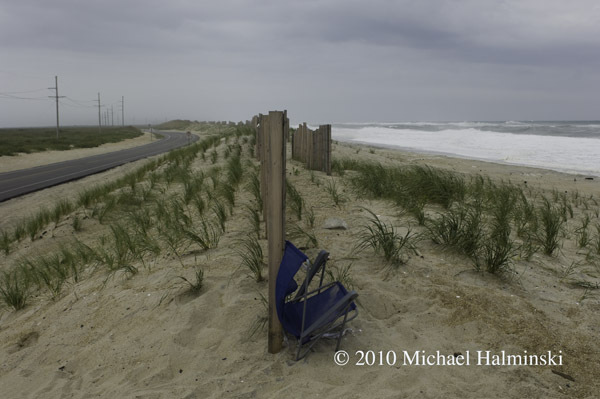 Everywhere are signs of the power of nature, and it could have been so much different had Earl been any closer. Serendipity is still snug on its new location. 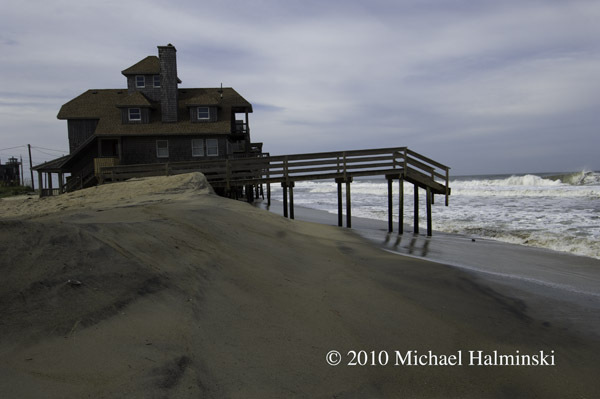 Before the storm, these steps at Mirlo Beach were touching the sand. 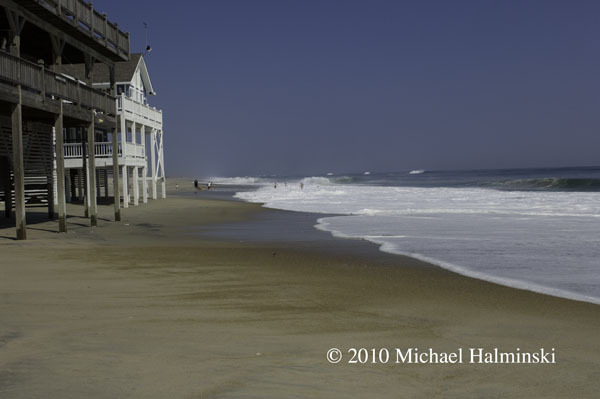 The oceanfront at Mirlo Beach almost always receives the highest impact. 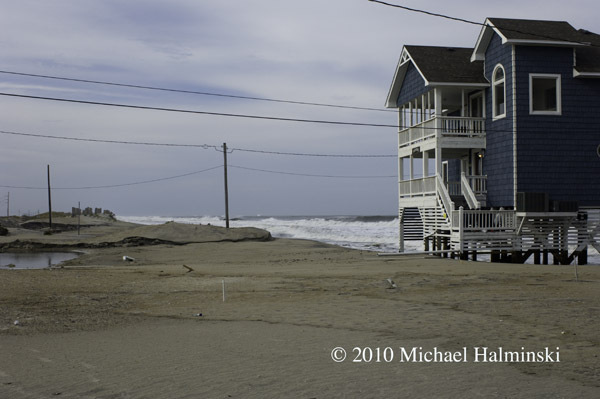 With one of the highest erosion rates in the state, it’s probably not long before these homes succumb to the ocean’s power. Yesterday the county just re-condemned three more properties. The northern-most cottage, Tailwinds is nearly on it’s last legs. Looking at the S-Curve area, the scene is not as bad as anticipated. 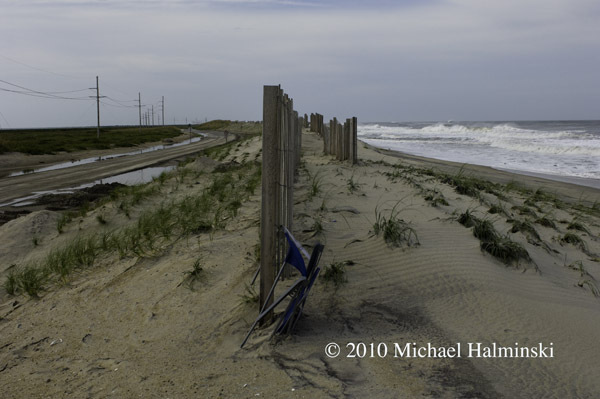 Two days ago, I would have bet money that this sand fence and dune would be completely washed away, along with some highway pavement. This being intact sums up our good fortune with Hurricane Earl. NCDOT did not waste any time going to work clearing the highway. 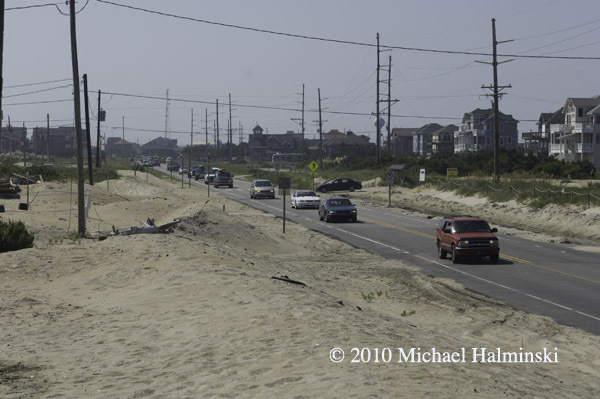 This morning at 7 AM, the road was opened to traffic for the big Labor Day weekend. 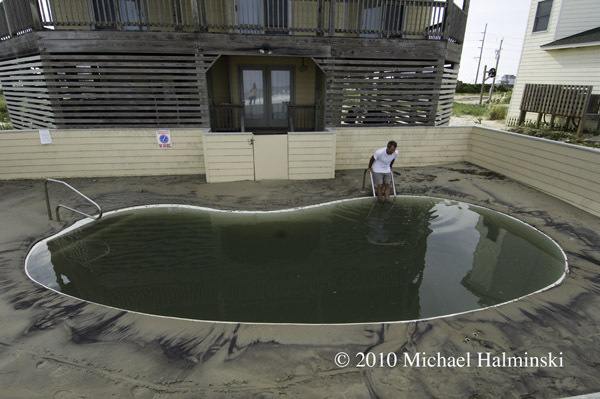 But be careful about which salt water swimming pool you dive into….. 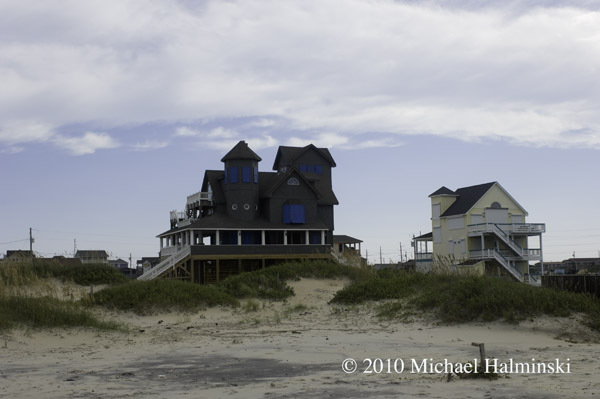 This entry was posted in beach, buildings, Outer Banks, storms, Weather on September 4, 2010 by j0jgvm89bj. Things are calming down quickly. The rain has abated, and the sound tide has rolled moderately enough to not flood my workshop under the house. 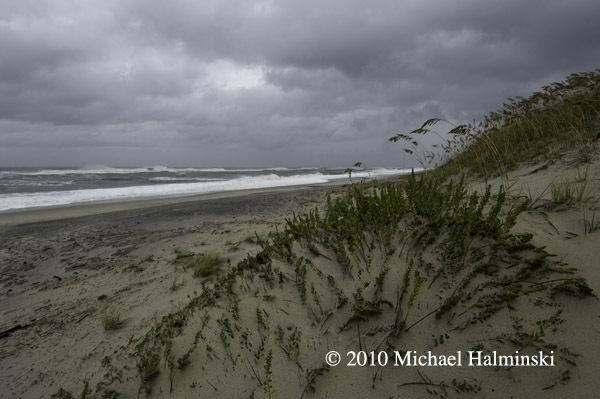 The beach was a sight to behold, blown clean by wind and tide. 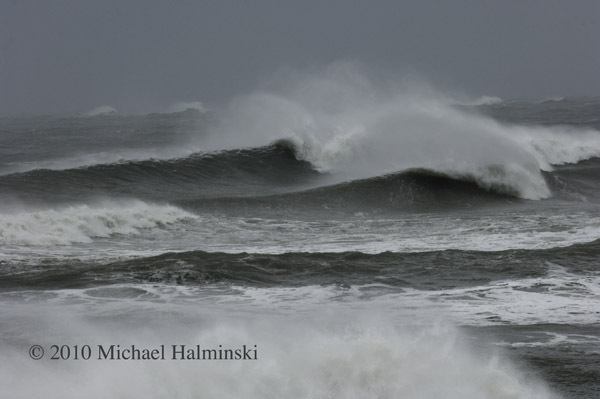 Enormous waves breaking into the offshore wind. 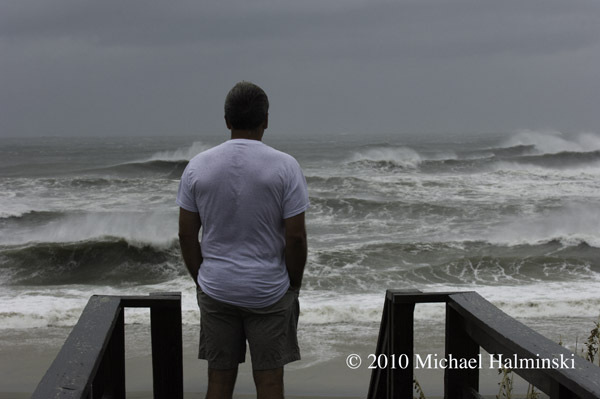 Ray Murray checks the surf after Hurricane Earl has passed. 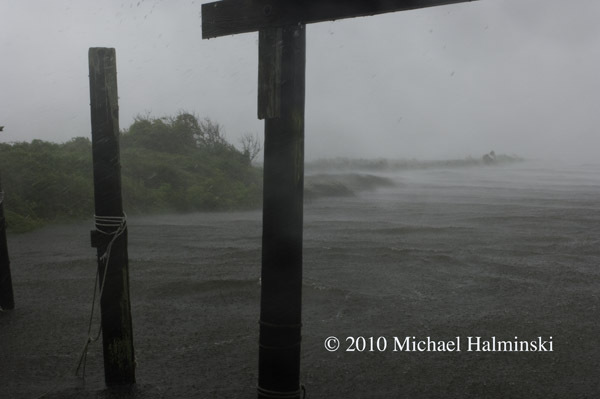 This entry was posted in beach, Outer Banks, Pamlico Sound, Sea, storms, Weather on September 3, 2010 by j0jgvm89bj. Last night it was good news to hear about Earl’s slight change in course. 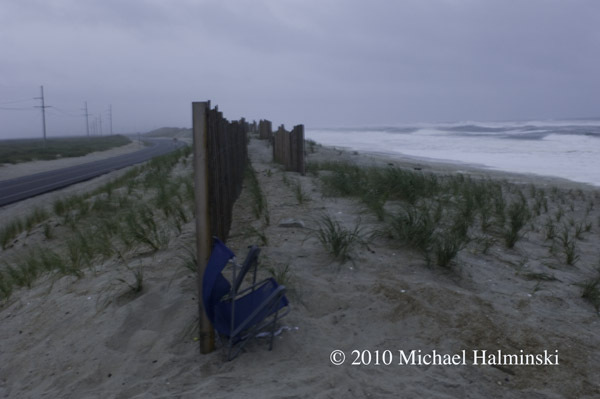 We checked the S-Curve at sundown, and found the seas just starting to wet the highway. 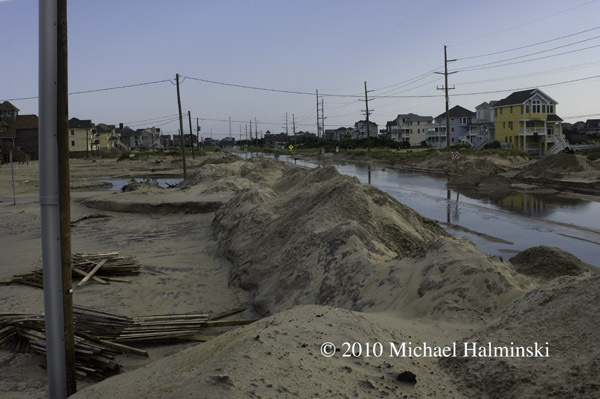 Water was washing up under the houses. The skies looking ominous. 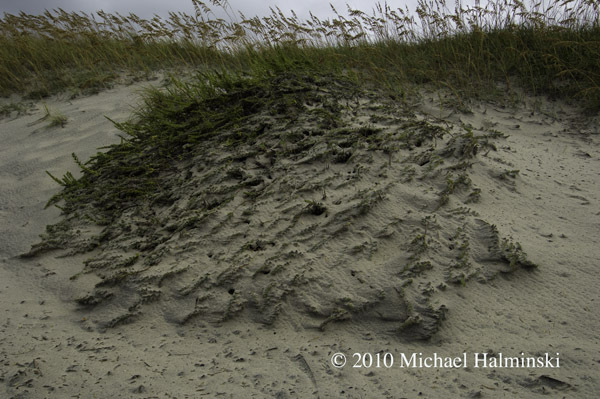 Here’s the S-Curve sand fence again. You can see things are beginning to tighten up. It must have washed away by now. 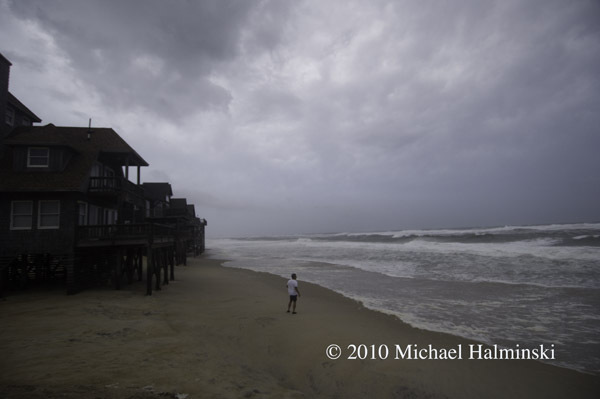 My brother-in-law Ray Murray is from Missouri, and this was is his first hurricane. This is the outer edges of the storm thickening. Wind was picking up by the minute. I was awakened about 5:45 this morning to an abrupt shaking of the house. The winds are picking up from the backside of Earl, shifting northwest. I’m always amazed at the one-two punch of storms like this. You can tell where you are relative to the center of circulation. Straight east of us is due north winds, switching hard to northwest as the storm passes. So far we’ve had about 5 inches of rain here, with signs of it tapering off. I wouldn’t be surprised if, at some point, we had winds in the range of 80 to 90. By the time I had checked the barometer, it had gone up to 990 millibars from what ever it was during the peak. This is a view from my neighbor’s fish house. 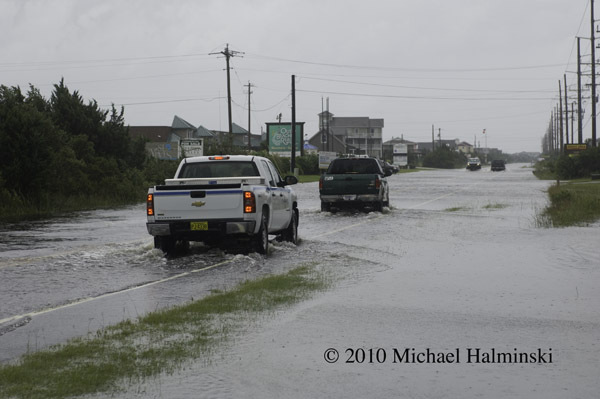 The sound tide has risen a couple of feet, flooding highway 12. 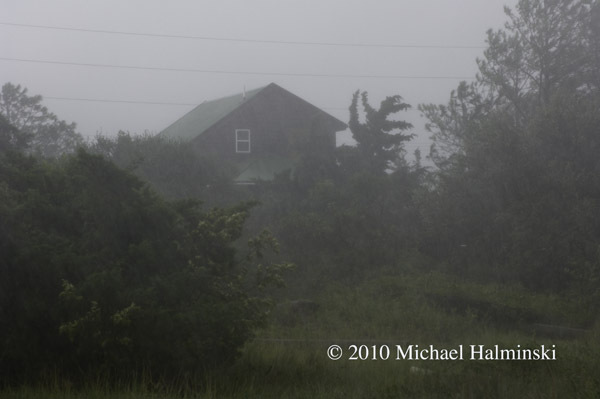 I’d heard that digital cameras were pretty good in the rain, so decided to put it to the test. Right about this time a serious squall came through. Look how well the marshlands absorb the seas. Mi Casa during the squall. 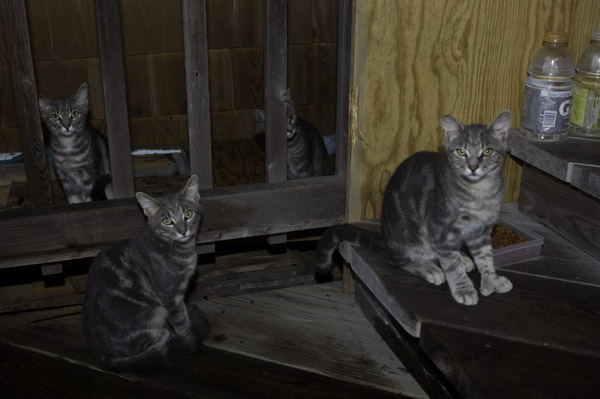 Our adopted feral kittens were sacked out in the hurricane hole that we built for them. 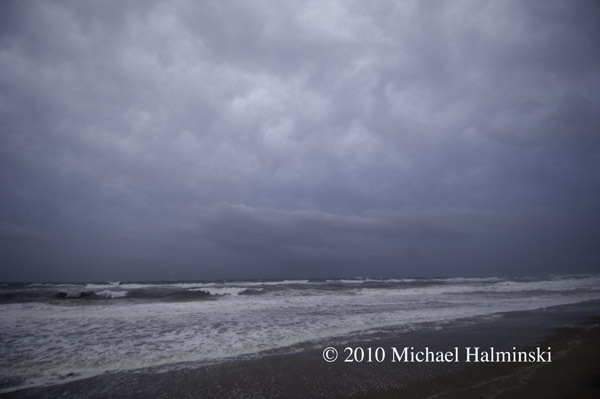 This entry was posted in beach, Outer Banks, storms, Weather on September 3, 2010 by j0jgvm89bj. 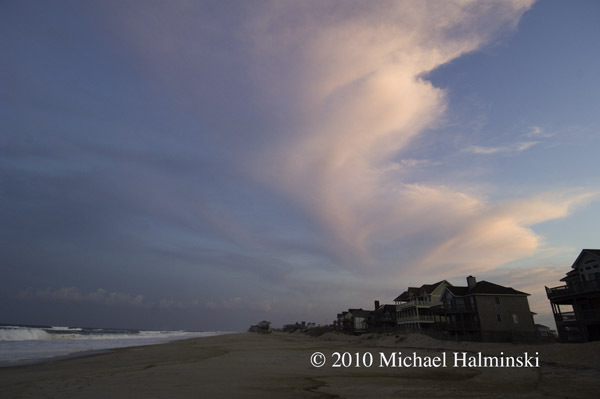 Years ago, before there was cable television and the internet on Hatteras Island, I relied a lot on weather radios. I also had my dad, a career meteorologist, for tracking and updates of tropical systems. With an approaching hurricane my dad would look at surrounding pressure systems and could plot a course using his protractor and a set of parallels. 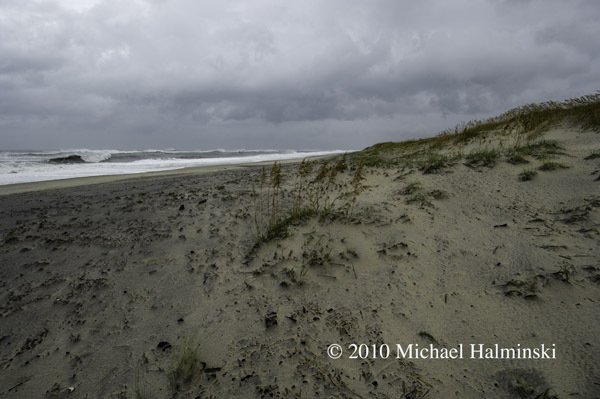 He had an uncanny sense of predicting where the storms were headed, and a detached calmness even about a major hurricane bearing down on one of his sons. Today of course, we have the world wide web of information. And that’s a good thing, because my dad is gone, and it’s helpful to know what we’re in for. Hurricane Earl is forecast to head our way and veer off slightly to the north northeast just south of the Cape. And that would be a good thing. Hopefully we can dodge this storm, like many others. 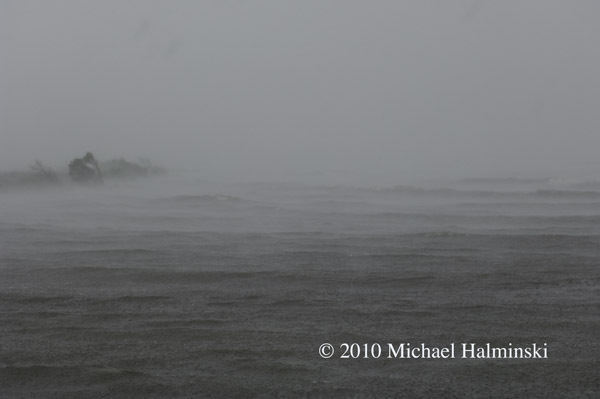 Yesterday morning I drove up to the S-Curve to check the swell, and it had definitely picked up. 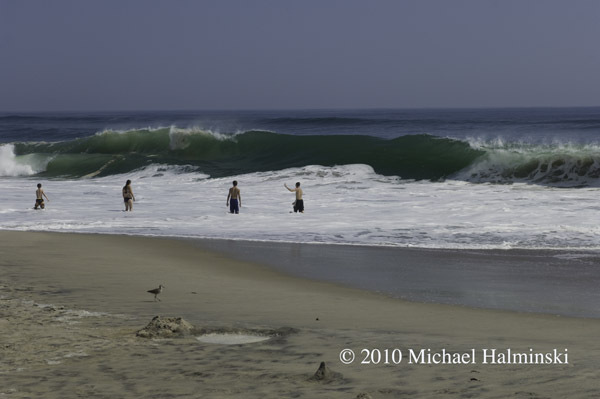 There were a few brave souls playing near the shore break, and even some body boarders getting some thrilling rides. From the beautiful weather, you’d hardly know that there was an approaching storm. Playing close to the shorebreak at S-Curve. 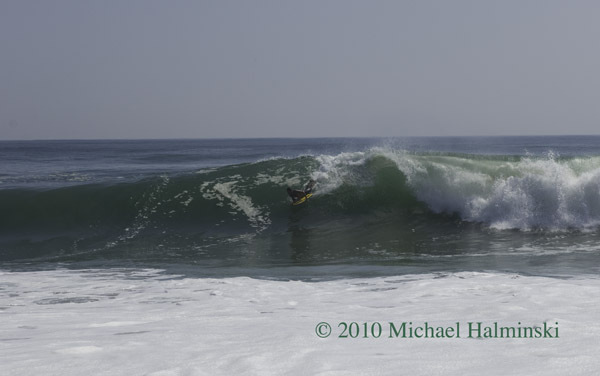 Body boarding on a big glassy face. Evacuees leaving town through Mirlo Beach. 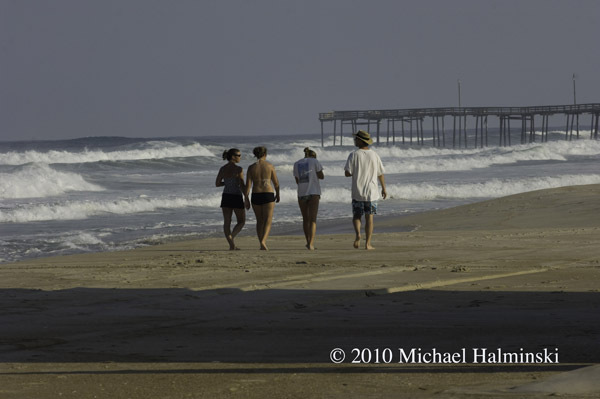 Making the most of the last day of gorgeous weather near Rodanthe Pier. The end of Wednesday with swirling high clouds. Next morning, after a restless sleep, I wonder what the next 24 hours will have in store. It’s hot and humid, and light northeast winds. The house is boarded up with plywood that I bought 28 years ago. All boarded up and ready to move vehicles to higher ground. 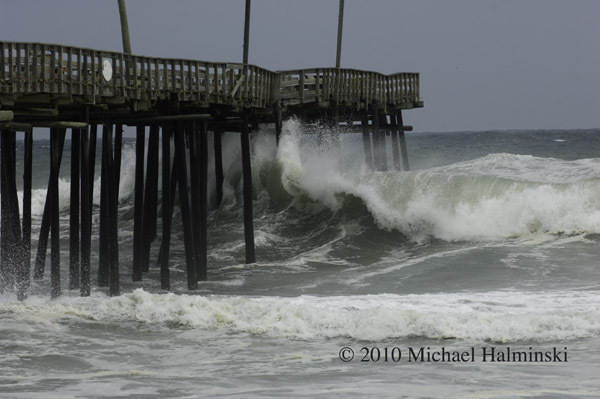 Thursday brings in rough surf at Rodanthe Pier. 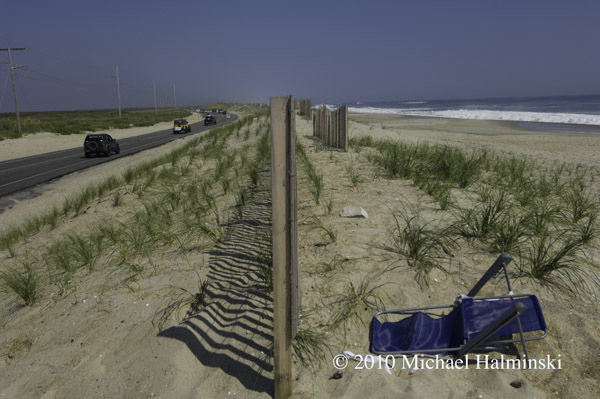 The artificial dune at S-Curve on Wednesday morning. Same location on Thursday. Hurricane Earl will pass in several hours, and like many hurricanes, at night. I can’t tell you how hot and humid it is, and I’m worn out from all the preparations. It’ll be a long night. I intend to expand this blog entry as time goes on. So stay tuned. 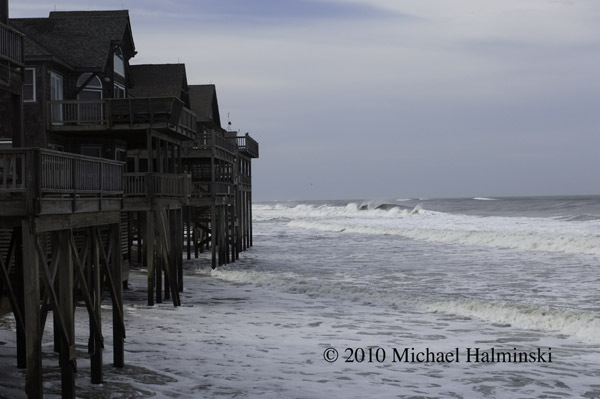 This entry was posted in beach, buildings, Outer Banks, Piers, Sea, storms, Weather on September 2, 2010 by j0jgvm89bj.